It is suggestive to juxtapose Byblos [Lebanon] and the sea. There one can still imagine the 7,000 years of history and illustrious characters — real and mythical — who have landed on this shore and walked along these same sands. Yes, one can truly say that history has passed by here. In the inlet that embraces the port and the beach, the sea is respectfully calm; an atmosphere of anticipation pervades the narrow streets of the town center. Byblos, that city which we studied in school in the pages dedicated to the Phoenicians, has in reality received and been host to many other cultures. A seaport, a strategic point both commercially and militarily, is today a tranquil, small city in which ancient history and diverse cultures coexist in mutual respect. If its neighbor Beirut is frenetic and convulsive, Byblos is the exact opposite. Its rhythms are those of the fishermen who meet on the beach at first light to untangle their nets, the rhythms of walking (cars don’t come into the narrow little streets in the center of town). Here one learns again to enjoy the little things. The small boats of the fishermen, once the fish are unloaded and sold, can become a means of travel along the coast. The fishermen, for a few Lebanese coins, will generally give tours lasting a quarter of an hour. But just ask — it’s hard to refuse — and you can find yourself embarking on a half-day cruise, going off to explore the sea bottom in search of ruins. From the beach of soft white sand you feel the reassuring embrace of the city behind you. The little restaurants offering authentic Lebanese cuisine and the cafés facing the sea are meeting places not only for the tourists on day trips, but above all for the local residents who stop in for a few minutes or hours to read the papers or discuss in Arabic something that always seems very important. It may be politics, sports, or an episode of city life. Byblos is one of the most ancient cities in the world. Different civilizations have left their still-visible marks on the archaeological sites that extend over a very broad area. 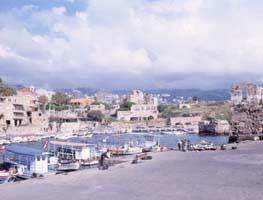 Byblos was already settled in the Neolithic period; there are traces of habitations dating back to 5000 B.C. ; around 3000 B.C. it had become one of the most important ports on the Mediterranean for trade with Egypt in cedar and olive oil. The Phoenicians settled here around 1000 B.C., and thanks to them the first phonetic alphabet was created, which seems to have developed out of a need to have a system for recording commercial transactions. Assyrians, Babylonians, Persians, Alexander the Great, who prepared here for his war against the pharaohs of Egypt, Greeks, Romans, Arabs, Crusaders: All have sown seeds of culture and tradition here, with the result that today Lebanon is a rich and multifaceted country. Diverse cultures live together peacefully. Walking in the labyrinth of narrow streets in the small ancient city, marked off by walls of the whitest stone, one comes upon a little plaza in which the Church of San Giorgio stands. On Sunday afternoons in summer, religious services are held outdoors. People singing and praying in the streets are a common sight. A short distance away there stands a mosque. At sunset, and at three other times during the day, the Muslims say their prayers. Then the muezzin begins his song. At this point the religious service being held under the symbol of the cross pauses and waits in silence for Allah to receive the homage of his people. It’s a matter of just a few minutes — as soon as the muezzin finishes his song, the ceremony in front of San Giorgio resumes — but time enough to understand that, at least here, in tranquil Byblos, people know respect and conviviality. The Church of San Giorgio was built by the Crusaders when they landed in 1104 and restored the city to its ancient splendor. In addition to the building under the sign of the cross, they built the Castello, which still dominates the ancient citadel from the top of a hill not far from the center of town. Climbing to the the highest point in the building constructed of enormous stone blocks recovered from ruins dating from the Roman and Phoenician eras (among the largest ever used in a medieval-era building) affords a panoramic view of Byblos. The atmosphere of the Middle Ages can also be felt walking through the narrow streets of the souk [market], recently rebuilt but in a manner to preserve the structure in the various styles that have characterized it through the centuries. It is not frequented by tourists, at least not by those who arrive by train, walk around with a guide carrying a red umbrella (the better to be recognized), and quickly depart at a precise hour. The little shops are frequented by the local people doing their shopping and by the chance curious tourist who may have penetrated into the labyrinth; here is the common life of everyday Byblos. The shops sell everything — small artisanal objects, clothing, pirate CDs of Arabic and pop music, Lebanese bread sold in very large loaves that keeps for several days and tastes good toasted, the strange fruit called loz (a green berry the size of an almond, eaten whole), perfumed oils, spices, sweets, honeyed cookies, and the freshest fish caught hours before by the fishermen. This is everyday Byblos. The atmosphere is calm, the people smiling and helpful. They don’t all speak French or English, but in the quiet rhythm of their lives, they always find time to try to understand when someone asks for information. The history of Byblos is a story of transience and permanence, of open doors to the diverse foreign cultures that Byblos has accumulated and that its people today continue to accumulate. Archaeologically, Byblos is one of the richest sites in Lebanon. Besides the Castello of the Crusaders, there are many ruins from past civilizations. The bastions of the fortification, which extend from the Castello to the sea where the ancient city ended, date back to 3000 B.C. Here are six different structures, which together create a wall 25 meters thick. From the same period is the Temple of Resheph, burned and rebuilt, today called the Temple of the Obelisks. The oldest temple is that of Baalat Gebal, which also has been burned and rebuilt twice. Only six columns remain in the colonnade, dating from 300 A.D., which leads up to the remnants of the temple. The Roman Theater is among the best-preserved buildings. It has been rebuilt, and the present edifice is one-third the size of the original, but its visual impact is striking. It faces the sea, and has a series of small doors in its facade. The mosaics that once formed the pavement have been transported to the National Museum in Beirut. Cyrus the Great conquered Babylon in 539 B.C. At this time Byblos was re-evaluated strategically from a military and commercial point of view and came to be seen as a link joining the Occident and the Orient. An intact fortress dating from this period demonstrates that Byblos was an important advance post of Persian civilization’s movement toward the West. The city became one of the most important centers of worship in the cult of Adonis. In 333 B.C., the army of Alexander the Great liberated Cilicia, Lycia, and Pamphylia before arriving at Issus, where they encountered and defeated the Persian army of Darius III. From there, Alexander departed for the conquest of Egypt, passing through Phoenicia to Byblos, where he met no resistance. The city made an alliance with him, allowing him free passage to the south.